I think i fell in love with the name of this band before i ever listened to them. They sent us a promo back in 2011, and fortunately the music lives up to the hype of the name. This is a noisy, dense, shoegaze band who apparently are now based in Nashville. Is And Always Was Daniel Johnston's Delay Pedal is a 7" single that consists of two covers of Daniel Johnson tunes. I am not that familiar with Mr. Johnston. I know that he makes lo-fi kind of music, and that he is schizophrenic. 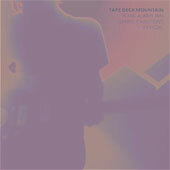 Tape Deck Mountain are obviously fans, and they are donating the proceeds from this single to the National Alliance on Mental Illness, which is nice of them. The A-side is True Love Will Find You In the End, which is an excellent song. This is just a wall of noise, one guitar jarring, the other guitar just whirring, both over drums flat and loud. It is catchy and noisy and fun, like old classic shoegaze, with a sing-along chorus and a happy beat. Under all of that noise is a happy, fun pop tune. I love this one, but have no idea how it compares to the original. The B-side is Devil Town, a song with an eeriness to match its name. The song consists mostly of some faint ambient noise and the voice, echoed. The song seems to meander pointlessly and not get anywhere. So there you go: one really great song and one that seems too meandering.